Perhaps the most enduring cause for this conflict is that about four thousand years ago this was the land of a semi-nomadic war lord who came to be called Abraham and who's god Yahweh became the 'One God' of Moses then, in due course, the single, universal, all-encompassing, deity shared by all three 'Abrahamic' religions: Judaism, Christianity and Islam. Once-upon-a-time this land was far more attractive to human habitation, lush and welcoming. Along with adjoining Lebanon, Jordan and Syria, the eastern shore of the Mediterranean was said to be a land of milk and honey. But climates change and expanding populations over-graze and cut down trees, as we have seen in desertified and deserted Petra, nearby in Jordan, that was a populous city in a green and pleasant landscape in the time of Herod. Now much of the Palestinian countryside varies in appearance from cultivated farmland, dependent on irrigation, to absolute desert. In many ways this is vast improvement since the end of the nineteenth century, when it was most frequently described by visitors from more verdant Europe as desolate, poor, backward and diseased. Malaria and malnutrition were endemic and Western aid focussed on the provision of hospitals. Today modern parts of Israel are a like resort areas of southern Europe or perhaps California. Many private houses are large and well appointed. There are many new high rise apartment blocks and more under construction. The use of a more or less standard colour scheme with light sandstone walls, and even raw concrete, gives the cities and towns a uniform clean or sandy look. The roads and other public infrastructure are of a high standard and prices are similar to those in southern France or Spain. Some parts of Jerusalem, Israel's largest city, remind me of Amman in Jordan or Damascus in Syria, before the recent destruction. Although not nearly as rundown as those in neighbouring Egypt, Arab areas are not nearly so wealthy in appearance as the up-market, mostly European, Jewish areas. But not all Jews are rich or live the high-life either. Around half of the Jewish population is ethnically middle eastern, from poorer backgrounds. The late model cars of the wealthy mix with the not so grand. If you are interested Google Street-view is worth a look. Try clicking this link to see a not so wealthy area. Physical appearance is where the similarity to Europe or California ends. This is a Jewish homeland, in many ways a theocracy. Very orthodox groups abound and we were told by a cab driver when driving us on Saturday that some areas are out of bounds as cars moving on the street are stoned. Almost all official public signage is in Hebrew. English is widely understood which is good as otherwise it would be a difficult place to visit. This is complemented of replaced by Arabic in the Arab areas. Comprehensible to us, English/Latin signage is reserved for commerce, like shop and restaurant names and advertising displays. About 20% of Israeli citizens are Arab, both Muslim and Christian, and they are in a strange coalition with each other in contrast to the Jewish majority. We found the Muslim Arabs almost universally friendly, but not necessarily adverse to ripping-off tourists. People of unknown religion we interacted with on public transport and and in street cafés particularly outside the old city were usually polite and helpful and might have been in a major city anywhere in the world. But Jews who were self-identifying by their mode of dress were frequently aloof to rude to us tourists, except when they seeking contributions to various causes like the Synagogue or the defence of Israel. One exception was an elderly German man who went out of his way to talk to us and had, he told us, come to Israel as a young adult. There is a link in this to our last overseas trip to the UK. In York we discovered that Constantine the Great, the founder of Roman Christianity, had served in the legion commanded by his father there. The first British Christian, St Alban, was martyred a few years earlier and Constantine would certainly have known of it as his mother was a Christian. When later he became Emperor he resolved to stop the infighting and schism within the Christian Church at the Council of Nicaea. It was he who then institutionalised Christianity as a new Roman religion and thus ensured its perpetuation. As a side benefit, a lot of competing 'pagan' temples lost patronage and their revenues flowed into Constantine's coffers. It was Helena, Constantine’s mother, who upon hearing of the finding of three crucifixions (presumably three crosses and two bodies) during modifications to a temple to Aphrodite on the hill just above here, decreed that this was Golgotha (Calvary) and ordered the construction of the first basilica here. Since then thousands of pilgrims have claimed this hill. There are a couple of half size crosses to carry if you would like. A moment's consideration is all that it takes to realise that you are not actually walking in the footsteps of Christ, no matter what your imagination and Jerusalem Syndrome might suggest. In Roman times the streets were a good ten to fifteen feet lower as several excavation sites around here demonstrate. And how has it escaped those who see this as other than an entirely symbolic and imaginative observance, that they are now walking through a Muslim market? This route was first defined some 300 years after the crucifixion is said to have occurred and it is very likely that it was quite arbitrarily chosen. There is also the problem of the probable mislocation of Golgotha. Many religious scholars have doubted Helena's choice of location, in part because it is unlikely that Jesus was crucified at a temple to Aphrodite that may have predated the event and no one thought to mention it. Instead the Gospels mention the place of a skull. Scholars have identified other locations in particular Skull Hill and the Garden Tomb outside the walls and thus more in keeping with the story. But this city has been besieged so often, and so many have been massacred here, that I imagine that you'll find a skull or crucifixion or two almost anywhere you dig, so take your pick. In due course Christianity based on Constantinople, Constantine's new capital (Byzantium now Istanbul) became known as Byzantine Christianity. With the fall of the Western Roman Empire in the fifth century the Eastern (Byzantine) Empire became the most powerful Empire in the world and remained so for over a thousand years until conquered by the Ottoman Turks (Muslims) in 1453. Actually the Church of the Holy Sepulchre is very interesting. Remnants may go back to around 260 but most is high Byzantine a hundred years later. Writing is in byzantine Greek. Services mainly Latin and Greek but we heard one in English they may be in numerous languages. This shrine has been expanded several times from it's consecration in 335. It has been damaged by fires, earthquakes and conflicts on numerous occasions. Its virtual destruction in 1009 became a motivation for Crusades. For almost a thousand years there has been tension between Roman, Latin speaking, Western Christianity and Greek speaking Eastern Christianity, heightened by an attack on Christian Constantinople by Western Christian Crusaders in 1204, and this schism became even more complex after the Protestant Reformation in Europe in the 16th Century. Eastern Christianity is still the predominant Christian faith everywhere from Egypt (Coptic) through the Middle East to Greece and Russia (Orthodox). Thus Christians have been fighting each other for supremacy in this basilica almost since it was built. As a result the keys have traditionally been held by a local Muslim family who are charged with keeping the peace. A friend in Germany told us that during his visit to the Basilica violence erupted between Greek Orthodox and another group of Christians, presumably Roman, resulting in a running fist-fight that he likened to a bar-room brawl in a wild west movie. The faithful praying in the Basilica, mostly women, are certainly intensely engaged and are matched only by the Jewish women in the tunnels along the western wall. More of that later. A number of Protestant Christians have been more inclined to the view that the Basilica is misplaced. There is a large Lutheran church a few hundred metres away that is quiet and pleasant inside, if a little too sterile to be interesting, and makes no special claims about its location. The third Abrahamic religion is in the majority in this sector and the call to prayer is heard at intervals during the day and men disappear from their shops. There is a tramway (tight rail) in Jerusalem that joins the Palestinian/ Arab East Jerusalem and the Jewish remainder. The Trams were designed and built by a French company and are very modern. The tramway features an architectural suspension bridge that has come to symbolise it. We needed to use it to to get to the Bus Station to go to Nazareth and had a trial run to other places of interest to work out how to buy tickets and so on. A helpful secular man showed us how to negotiate the ticket vending machine that appeared to have instructions only in Hebrew and Arabic in order to reach instructions in other languages. We might have expected French at least! But like almost everything here the Tram is steeped in controversy. A Muslim woman we talked to at some length told us that it used to be possible to use unexpired tickets to travel to work because other Muslims would give them to each other when they got off the tram. But this has been stopped by inspectors and heavy fines. So now she has to buy two full price tickets each day, whereas Jewish Israelis can purchase a weekly or monthly ticket and travel for a fraction of the price. To do that too she would need a credit card and/or ID Card that Muslims are reluctant to have as it makes them vulnerable to the Israeli authorities. Perhaps she is here illegally as a result of her religion? She sounded as if she is hiding-out somewhere - a bit like Anne Frank in her garret. The PLO fumes against an "illegal Zionist project" it says is designed to consolidate Israeli control over Arab districts seized after the Six-Day War in 1967. Ultraorthodox opponents have their own set of complaints. They worry about easy mingling of the sexes at tram stops and on the tram and say the light rail system will disturb a network of so-called "kosher buses," a privately run service that keeps male and female passengers separate. In a letter to city hall last year, seven rabbis complained that their followers will have to pass through secular areas "where a God-fearing person would not set foot." In Arab quarters of Jerusalem, meanwhile, supporters of the PLO raise more concrete issues: Will it be safe to get on a tram used by Israeli settlers? Nabil Issa, a shopkeeper whose store looks out on a heap of tram-related rubble, curses the project for disrupting his business and thinks that riding with Israelis will be "too risky." Some Jewish settlers, he says, can be aggressive but he's more worried that the tram will become a target for Palestinian militants. "It is not safe for my family to ride with Israelis," says Mr. Issa. Since then we have returned to Sydney only to see on television a car careering along the platform of the Ammunition Hill tram stop, where we stood, killing a child and injuring eight. The Palestinian driver was shot 'trying to escape'. The previous day (October 22), a few hours apart in real time, a car was backed through a Neutral Bay coffee shop in Sydney injuring seven people. When the TV cameras arrived the shaken driver was being commiserated with by some of the victims of the terrible accident. They were all taken of to hospital for observation. Since that time the Jerusalem driver has been identified as a Palestinian terrorist, as well he may have been, and the city was in lock-down as recriminations fly on both sides. The Israelis say Abdul Rahman Shaloudi was a terrorist who deliberately drove his car into a crowd of at a tram stop last week. A baby and a 20 year old woman were killed. The driver was shot at the scene by police and died later. "Thank God. Thank God that my son is a martyr," his mother says at his funeral. "He had a smile on his face; finally he is happy now. Thank God." There've been nightly clashes in Jerusalem and the West Bank ever since last week's incident. In one demonstration, a 14 year old Palestinian boy was shot and killed by Israeli forces. In this environment of anger and unrest, Israel's prime minister has reportedly moved to advance plans for 1,000 new units in two different settlements in East Jerusalem. "There is a public consensus that Israel has the full right to build in the Jewish neighbourhoods in Jerusalem and in the settlement blocks," Benjamin Netanyahu told the Knesset. "All the governments of Israel in the past 50 years have done so. It is also clear to the Palestinians that these places will remain under Israeli sovereignty in any future arrangement," he said. "The French build in Paris, the English build in London, Israelis build in Jerusalem." As he was speaking, the Palestinian prime minister Rami Hamdallah was making a rare visit to the Al Aqsa Mosque in Jerusalem's old city: the site the Israelis call the Temple Mount. "All the Israeli violations, all these settlements, everything that the occupation is doing in this area is illegitimate", he declared. "It is confirmed by the judgement of history that any occupation in the world has to end. God willing this occupation will end and there will be an independent Palestinian state with East Jerusalem as its capital." After I wrote this, running down Israelis with a car has become a new fashion among Palestinians in Jerusalem and has happened twice again, in the street and at a bus stop, an iron-bar wielding perpetrator being shot on the spot. We asked the Muslim woman we befriended what she thought the resolution to the obvious tensions might be. She told us God will bring peace. Later our Christian cab driver/guide said exactly the same thing. A lot of people here believe in prophecy or in the will and ultimate plan of God, as obscure as that seems here. A lot of people seem to be very scared. No one Jewish has yet expressed this view but I'm sure they might. They seem to be preparing for a fight. 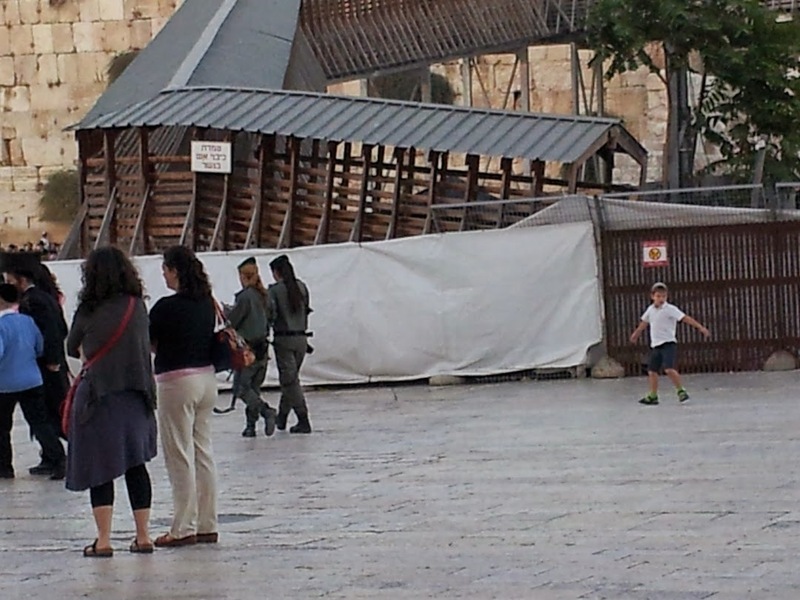 There are Jewish kids in uniform everywhere, many of them girls, carrying weapons and live rounds. In the Old City weapons are more or less restricted to the Jewish quarter. In the Muslim quarter, around our hotel, there is just an occasional police person with a sidearm. At night at least one passage that we attempted to use between the quarters was blocked by gates and armed guards. We are here for three more days then back to Germany where there is absolutely no sense of danger and no one is carrying guns. How things change! Part of the old city is an archaeological dig and sheds new light on many of our oldest myths. Around 950 BCE King Solomon built a Temple in Jerusalem to house the Arc of the Covenant and it became the most important Jewish shrine for around 400 years. Both Babylonian and Hebrew records agree that it was destroyed in the second Babylonian siege of the city. 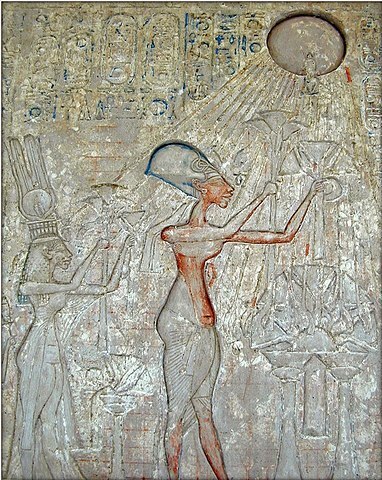 Babylonian records suggest that this was in the summer of 587 BCE. The secular dates differ from the rabbinical dates. King Darius the Great completed a replacement Second Temple in 516 BCE on the hill that is now covered by the mass of the Temple Mount. This temple then served for another half millennia with minor extensions to the Mount until Herod decided to undertake its renovation. At the time of Herod the Great Judea was very wealthy. The Romans had recently replaced the Greeks (Alexandrians - Egyptians) as overlords and Herod, the king of Judea, was a consummate builder of ports, forts and temples. He completely rebuilt the Temple between 20 and 18 BCE. According to the Roman Historian Flavius Josephus he even replaced the foundation stones and restructured the Temple Mount. As a result of Herod's new improved Temple Jews flooded in from around the Diaspora. There was a half Shekel head tax on all Jews, to be paid at the Temple, and all were expected to make an animal sacrifice there, usually a lamb or goat. Special cleansing baths can still be seen among the ruins. On the archaeology museum site today there is an audiovisual presentation dramatizing this with the story of a man coming in to the temple exchanging his money, paying his tax and buying his animal for sacrifice. It is said that the temple featured unusually large gutters, not for rainwater but to deal with the flow of blood. There was a huge industry around providing and selling animals and, presumably, preparing the carcasses that were supposed to be cooked with the entrails still inside then eaten ritually. Money changers exchanged currencies into Shekels for these transactions with the usual degree of honesty, constrained only by marketplace competition. and so on, back to Abraham and Adam. If only Ancestry.com could do this for 40 or so generations. Many scholars believe that these Messianic Gospels were subsequently 'tweaked' to accommodate the Immaculate Conception and the idea that Jesus was conceived by God, and thus presumably sacrificing the idea that he was the Messiah. Herod who, it is suggested, would himself have liked to have been the Messiah died in 4 BCE and was succeeded by Herod Archelaus who reigned until 6 CE until being exiled to Southern France (see my travel diary there) for inciting extreme religious unrest, that began when he put a Golden Eagle over the Temple. He was succeeded by his brother Herod Antipas, who ruled Judea under the oversight of the Roman Prefect, Pontius Pilate (CE 26–36). Thus these three kings spanned the events that are related in the Gospels of the New Testament. Herod the Great is said to have received the Magi and to have ordered the massacre of the innocents around the time of Jesus’ birth. To escape this fate Joseph his father: "took the child and his mother during the night and left for Egypt, where he stayed until the death of Herod" (Mathew 2:15). Most secular scholars think that this killing is unlikely to have taken place, as it is unlike Herod to be bothered and it is an obvious retelling of an earlier myth. Similarly the reason for the family going to Bethlehem must be wrong as the Census of Quirinius was over ten years after Herod died and that story also makes Jesus too young for later chronology that has to fit with Herod Antipas the death of John the Baptist and Pontius Pilate. Also Bethlehem was the reputed birthplace of King David so it suited prophesy to allege that Jesus was born there too. At the other end of his life, in one account, Herod Antipas is said to have refused to try Jesus and to have sent him back to Pilot, who then ordered his execution. So that was some time after 26 and prior to 36 CE. Thus the historical Jesus must have been no younger than 30 and no older that his early 40's when he was executed. This accords with Mathew's assertion that he began his ministry at about the age of 30. As this began with his baptism it must have been before John the Baptist parted with his head, thanks to Herod Antipas and Salome. This execution is reasonably certain to have happened more or less as reported in the Gospels as it is confirmed by actual contemporary sources. The execution was blamed for Herod's subsequent defeat by Aretas IV (nemesis of Paul) during the winter of CE 36/37. All the synoptic Christian gospels began as oral history, written down after the death of Jesus and they are frequently contradictory about times, dates and places. Later Gospels are even more imaginative. For example John's Gospel doesn't even get the date of the Passover correct. The Hebrew calendar is/was Luna and there are only two dates between 26 and 36 when Friday (the Sabbath) plausibly coincided with the Passover. This gives the two possible dates for the Crucifixion as: Friday 7 April 30 and Friday 3 April 33. But there is an apparent reference, in all three synoptic Gospels, to a solar eclipse at the Crucifixion: Now from the sixth hour until the ninth hour there was darkness over all the land. This sounds like an eclipse not just a change in the weather, but a solar eclipse only happens at new moon and couldn't have happened at the Passover, which always coincides with the full moon. However, there was a Luna eclipse that was partially visible in Jerusalem on the night of April 3, 33 CE. This has caused many to choose the latter date. A Luna eclipse could not account for hours of darkness during the day but its coincidence with a crucifixion would certainly have been seen as a potent omen by the superstitious. If this coincidence indeed occurred it would undoubtedly have become more significant with each retelling, like the impact of Halley's Comet on the Norman Conquest. These various diversions from known facts illustrate, yet again, that these are works of poetry and imagination, intended for religious instruction, and should not be taken literally, as historical fact. Today the actual, historic, Second Temple, in which Jesus is said to have attacked the money changers, and was alleged to have wanted to destroy the entire structure, the crime for which he was crucified, is gone. He had nothing to do with that. 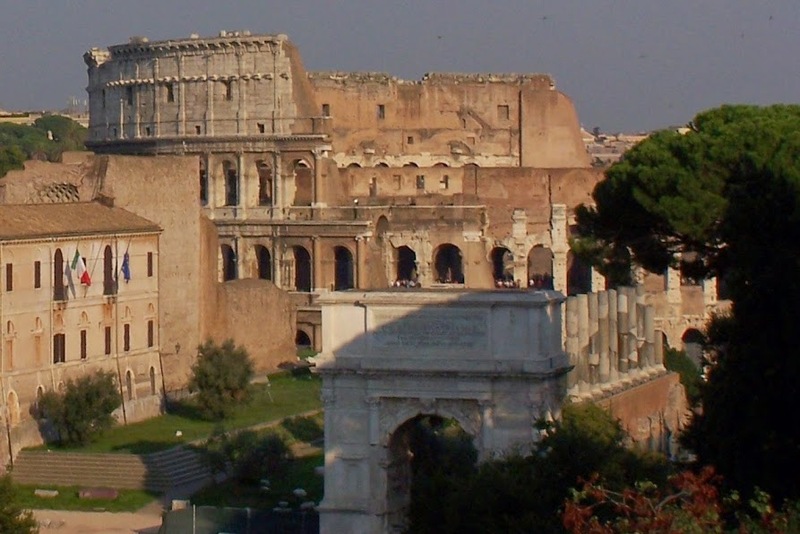 The Romans destroyed it in 70 CE. The war in which this occurred had probably been brewing since around the time of Jesus. The people of Judea were growing economically stronger, and longed for independence. What have the Romans (proxy for the British) ever done for us? And the wine… that's something we'd really miss, Reg, if the Romans left. Huh. At the same time the Emperors of Rome, after the death of Julius Caesar, were becoming increasingly unstable and megalomaniacal. In 37 CE Gaius Caligula came to power and to gain his approval one of his underlings decided to put his statue in every temple in the Roman world. Like golden eagles or any other statue, this is strictly forbidden in a Jewish place of worship by the Biblical second commandment, against graven images and idols, and the Jews revolted. Thus the first Jewish-Roman war began. Long story short: after a couple of ignominious defeats, as a result of underestimating the strength and resourcefulness of the Jews, the Romans applied some serious resources to putting down the uprising. The future Emperor, Titus led four legions, comprising about 60,000 trained soldiers, and surrounded Jerusalem in February 70 CE. Attempts at negotiation failed. Although it was besieged, foragers had dug tunnels through which they were resupplying the city. Sound familiar? To prevent this, the Romans built their own outer wall around the city and in the no-mans-land between the walls they crucified any foragers they caught. Then in August the Romans finally moved in and crushed the Judean defenders, reportedly killing around a million inhabitants and sending another 97,000 into slavery. The Arch of Titus (constructed in 82 CE) still stands in Rome commemorating these events and illustrating the sacking of Jerusalem in a surviving frieze. It is said that Titus wanted to preserve the Temple, as he wished to rededicate it to the Roman Pantheon, but it was inadvertently consumed by fire during the fighting. But the huge and impressive Temple Mount remains to this day, a tribute to Herodian (basically Roman) civil engineering. Meanwhile, Temple Mount is said to be built over Mount Moriah claimed to be the location of the Rock upon which Abraham was going to sacrifice his son Isaac, until God's last minute reprieve, and is holy to Islam. So, after Jerusalem fell to Islam, the Muslims built The Dome Of The Rock on the site (where it stands today - very beautiful) and the nearby, at the Southern end of the Temple Mount, the Al Aqsa Mosque. This supposed sacrilege, against whom, the Jews (? ), was one of the motivations for the First Crusade. On 13 July 1099 the besieging Crusaders launched their final assault on the city and many Muslims sought sanctuary in this mosque. Initially they were not harmed but a day later they joined the tens of thousands massacred in the city. I had a quick glimpse through the door of the Mosque but was quickly ejected. It seemed unremarkable compared to many other mosques I've been allowed to enter, particularly the wonderful historic mosque in Damascus, the Blue mosque in Istanbul and the mosque/cathedral in Cordoba. I hadn't expected to be excluded, Australian mosques are generally open and I had no problem going into the mosque in Nazareth where we were both made welcome. But this one is controversial. Jewish fundamentalists have recently caused riots in Jerusalem by invading it, fermenting on-going religious confrontations. We saw a small taste of this on Shabbat when Jewish groups went out of their way to walk, several abreast, through the Muslim section of the Old City near our hotel. For many years the Western Wall of Herod's great oblong Temple Mount on which the temple was built, provides the closest point to the ancient holy of holies of the first and Second Temples, where the Arc of the Covenant was housed, so Jews pray there. Underground in archaeological tunnels you can get even nearer to the location of the Jewish Holy of Holies and this is preserved for faithful women who insert little messages in the cracks and pray vehemently, rocking back and forth. Men not allowed unless on a tour. 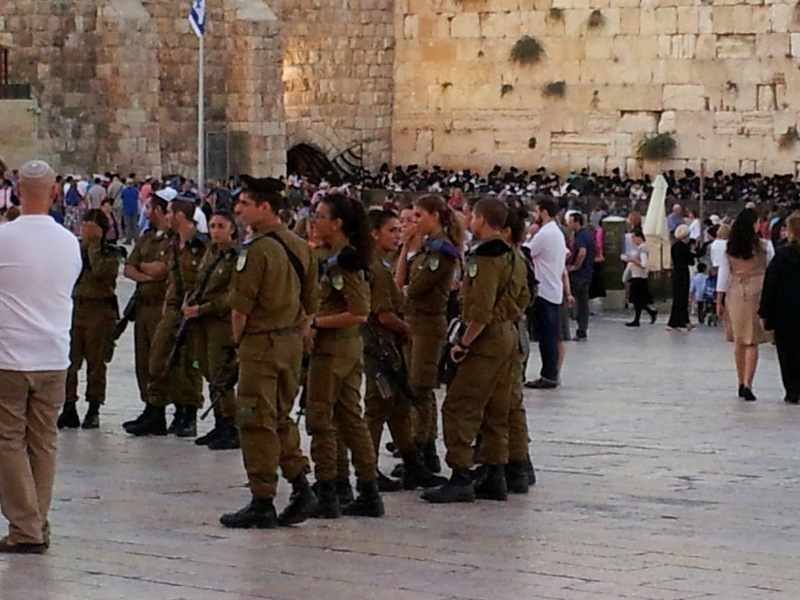 Indeed, even above-ground, except at Shabbat when huge numbers converge, women frequently outnumber men at the Western Wall, each in their own area of course. This mirrors the Christians up the hill at the reputed location of Calvary where women fall to their knees and kiss various venerated objects with similar passion. The Muslims on the other hand regard religion, at least in public, to be men's business. A short walk down the Via Dolorosa and out through the Lion Gate leads to a shrine to Mary (Tomb of Mary) and the Garden of Gethsemane, at the foot of the Mount of Olives. Again it is more about imagination and faith than substance. Mary did not become significant until it was first asserted that Jesus was the son of God by means of Immaculate Conception, decades after his death, and presumably her death, so it is unlikely that anyone took note of where she was actually buried. But Eastern Christians have elected this spot as her tomb. Western Christians on the other hand have long asserted that she was Assumed into heaven in bodily form, possibly before she died. These arcane theological issues became more important to believers during the Reformation when the 'Cult of Mary' came to differentiate Protestants from Catholics. The location of the Garden of Gethsemane is similarly controversial and no less arbitrary. The presently publicised one is the most favoured of four possible locations, having been a place of pilgrimage for at least a thousand years. Several olive trees in the garden are very old and some once naïvely believed that they date back to the Saviour's time. This is plausible as olive trees can be very old. The oldest known living olive trees are on Crete and are believed to be 2000 to 3000 years old. Carbon dating and genetic analysis of those at Gethsemane reveals that they were planted a little after the Norman Conquest of England, around 1092 CE, and the oldest ones are all cuttings from a single parent plant. It seems obvious that they were panted when the garden was laid out in its present form, around the time of the Crusades. Perhaps least controversially located is the Mount of Olives itself. Its location is as certain as the location of the city of Jerusalem, if not some holy sites within or without. The Mount has Jewish graves and burial chambers dating back over three thousand years and is referred to in numerous ancient writings. It was a significant strategic factor in the Roman siege of Jerusalem in 70 CE. It is now covered in tens of thousands of Jewish graves and even features a multi-storey graveyard. We were told that many Jews want to be buried here as this will be the place of final judgement but I'm dubious that all Jews believe this. When the area was under Jordanian administration a large number of Jewish graves were destroyed by new roadwork and the building of an Hotel at the top. Palestinian troublemakers allegedly continue to take out their frustrations by desecrating Jewish graves on the Mount. The road to the top is quite steep and as we walked up the hill we were accosted several times by men in cars offering to give us a lift to the top. We supposed it to be some kind of scam but in any case we wanted the exercise. The view from the top is quite spectacular. At the top you can visit the garden in which Jesus is said to have taught his disciples The Lord's Prayer. Nearby is the point at which Jesus ascended to heaven, leaving his footprint in a rock. I found it necessary to suspend disbelief, particularly as there is a much more convincing footprint in a stone in the ancient footpath not far from the Holy Sepulchre. After seeing this I suggested to the nearby Arab shopkeeper selling religious paraphernalia, like rosary beads, icons, menorah and so on that he was missing a potential marketing opportunity - he looked at me quizzically. Nazareth is famous as the hometown of Jesus. It's located about 80 Km North of Tel-Aviv between the port of Haifa and the Sea of Galilee where Jesus is said to have begun his ministry. Nearby is the Ramat David Air Force base from which three squadrons of F16s keep the air alive overhead. It's quite mountainous here in Nazareth and the Bus wound its way up through the hills. The town itself has some very steep streets and a large part of the old centre is occupied by a traditional souk. Our hotel, in the midst of this, seemed at first sight to be on the 'rustic' side but turns out to be very comfortable with a large airy room and modern en-suite with a view and a pleasant communal sitting area just outside for enjoying a drink or two. Nazareth is the largest Arab town in Israel, at around 60,000. Here most Arabs are Israeli citizens. There were Jewish people in the suburbs as we entered the town but we were told that there are no Jews living in the Old Town area - that there's nothing stopping them 'they just don't want to'. It’s mainly Sunni Muslim but quite a few are Christian and there is a sizeable expatriate Christian community in and around several churches and convents. Whereas most Israeli Christians are Eastern Orthodox here the two major churches are Roman Catholic. The Basilica of the Annunciation is a modern ferro-concrete church built over the remains of Byzantine and Crusader churches. It incorporates the cave in which the Virgin Mary is said to have received the news from Gabriel that she would give birth to Jesus (the Annunciation). Nearby is a synagogue in which Jesus is said to have preached and a Greek Orthodox church with a rather reluctant man acting as guardian/caretaker. I was unable to take photos there but we were most welcome in the local mosque. Muslims make up about 20% of Israeli citizens and can and do elect local government in Nazareth. People we spoke to are not happy about the recent war against the people of Gaza and get concerned when military aircraft from the nearby base fly over. We were told that Arab children from the orphanage here could no longer be taken to the swimming baths where Jewish children go because of fights breaking out between them. I must say that it is quite pleasant here if a little quiet. We've had some pleasant meals and climbed some steep streets. It's a tourist town and tourism is the main industry with local businesses very welcoming. Many tourists are Christians visiting the place where the archangel Gabriel visited Mary to announce her miraculous impregnation. But not everyone endorses the cave in the Catholic Basilica as the correct location. There is also a church on the supposed site of Joseph's workshop and one can visit Mary's Well. I'm afraid that's much the worse for garbage thrown into it, and so on. Because of the strong Christian presence it is possible to enjoy a beer in public in a street cafe on a Saturday without anyone taking offence and on the whole the Muslims and Christians of various hues: Eastern and Roman and Protestant appear to be mutually respectful and charming. After giving me an answer in English one elderly Arab man asked why I don't learn Arabic. My only excuse was that there are just too many languages to learn. He smiled broadly and I suppose I did too. But there is a definite antigovernment undercurrent here, among both Christians and Muslims. People here are not happy about the recent war with Gaza. In particular because it has decimated tourism. A definite 'them and us' attitude exists between this community and the Jewish majority elsewhere. Since the Six Days War I've found that Jewish friends are often sympathetic to the continued existence of the State of Israel but not to the hard line position taken by extreme Zionists like the 'Settlers' and I have generally agreed. Israel as a State is obviously here to stay. But I can't see why it can't have a secular constitution like most other democracies. It has been said that the 'Jewish race' needs a homeland but that is an idea from the Austro-Hungarian Empire of the late 18th century, the same culture that gave us the 'master race'. A 'Jewish race' may have been plausible then but is evidently nonsense in today's Israel where hardly anyone conforms to the racial stereotype. 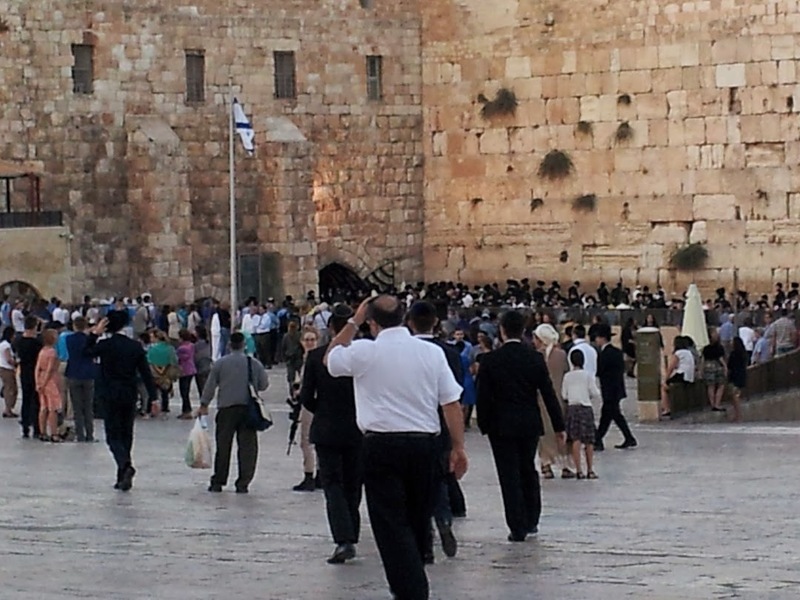 There are people of every ethnicity visiting the Western Wall at Shabbat. Only about half the population are Middle Eastern at all. The other half is distinctly European in appearance. It might as well be Australia or England or Germany or the USA or Russia. Tall blonds, short blonds, redheads, blue, green, hazel eyes slim, grossly obese all shapes and sizes, hardly a Jewish nose or even a Woody Allen in sight. So, if there is no distinct Jewish race we are left with the proposition that it is the religion that needs a special country where it can be practiced. Perhaps this is a desire of all religions? Catholics have Vatican city (and Malta), Buddhists Tibet. Even that seems problematic. As in most advanced cultures 20% are, like Herzl himself, secular atheists. At the other end of the spectrum no one seems too keen on the antics of the stone-throwing mosque-crashing ultra-orthodox Haredi or Hasidic activists, except presumably some in their own communities. In the early days, much of Israel was developed by kibbutzim (agricultural collectives) based on socialism (pure communism) in which women famously took an equal part with men and traditional religion was distained. Jewish traditions were still valued, perhaps by replacing traditional ceremonies with dancing and avoiding work on Saturday, but often kibbutzim were atheist and styled themselves 'Monasteries without God'. When I was at University in the 60's I met people who had been to Israel to work on a kibbutz and had friends who were planning to. Had Jews and Arabs been forced to make Palestine work as a mixed and integrated country or as two states, living in harmony, things might have been different. But now there is no going back. Israel is a country in which several generations of young Israelis have been born. What was once potentially soluble, had the British mandate survived; or the UN decided another way; or the Arabs had gone along with the UN resolution; seems to be a lost cause. Since 1948 there have been just over 3 million immigrants to Israel yet the population of Israel in 2014 has grown to approximately 8.2 million with 75 percent (6.15 million) being Jewish Israelis. Almost exactly half of this number are native born. Of the immigrants almost a third arrived from Europe in the first decade and another third from Russia and the Ukraine in the 1990's. Around 800 thousand are from predominantly Muslim countries, many fleeing persecution as tensions with Israel grew. The balance is from across the globe with the United States, Argentina and South Africa significant contributors. It has been argued that expelled Palestinians have a greater right to the country that recent immigrants but not so their children. The argument goes that native born children of any religion have every right to live in the country of their birth. Correspondingly, foreign born children of Palestinian refugees should not have the same right to the country as native born Jews or Arabs. So in due course all the refugees in Jordan and Egypt and Lebanon will be dead and their children will be natives of those countries. I'm sympathetic to this argument. I don't believe that I have a right to claim ownership of part of Scotland on the grounds that it is the land of my ancestors. But it's a bit more complex. I would want to say that ones roots, patriality, family origins and traditions do stand for something. This is particularly the case when families are forcibly expelled from their homeland. At the moment Israeli Jews and Arabs are trying to out-breed each other in a competition for the country in the future. A few years ago the Arabs were ahead but now the Jews have overtaken them and the Israeli population is growing at about 1.8 percent a year. There is no easy solution. Either a homeland must be found for the Palestinians or a single state must evolve in which the walls are removed and everyone becomes a citizen. Neither of these appears likely any time soon. Despite the huge numbers of arrivals and native born, Jews still do not outnumber the combined non-Jewish Arab populations in Israeli controlled Palestine if in addition to those living in Israel proper and East Jerusalem are added those in the Gaza Strip and the West Bank, that are effectively walled-off Arab ghettos. It is therefore probable that if the walls came down on both of these, and truly democratic elections were held, an Arab party would win government and promptly change the constitution and/or dramatically overhaul the Jewish State. One would like to think that they could put their religious and cultural differences aside but everything I've seen suggests that these differences are getting worse. Civil war would certainly reignite. The internationally accepted two state solution is equally problematic for both sides. The west Bank and Gaza Strip are geographically separated and have quite different objectives and priorities and solutions offered by Israel seem to be deliberately unacceptable. The actual Israeli solution seems to be to eat away at the potential Palestinian State by degrees, first by allowing and even encouraging the Settlers to annex parts of the less populous West Bank and east Jerusalem. At the same time Israel is systematically making the more populous but agriculturally richer Gaza Strip less and less viable. It is hard not to see the Gaza Strip as a besieged ghetto within which the population is periodically and devastatingly attacked for daring to fight back. It is surrounded by a wall and in-depth defences and blockaded from the sea. Many have likened it to Berlin during the blockade of that city. But unlike West Berlin it's not a place anyone would want to escape into. A similar, less fortified, but much longer, wall separates the Jewish State from the Palestinian West Bank: the West Bank Barrier. It runs along the 1949 Armistice Line, a total length of approximately 700 kilometres. It's a truly impressive engineering feat but not one calculated to improve Israel's relationship with the walled-off Palestinians. Unlike the unification of Germany, celebrated with beer and fireworks this week, I can only conclude that it will all end in tears, which is a pity as most of the people we met are very nice. Like people everywhere, everyone we met desperately wants to live their life in peace and harmony. But for many, in this land of uncompromising beliefs and ancient enmities, their colourful myths and traditions, and very real memories, get in the way of extending this desire for peace and harmony to others.